Three visits to Porteño over the last couple of years have earned it a place in my top favourites list in Sydney. I constantly rave about it to anyone with an interest in food and demand that those who haven’t experienced it must go! But I always follow up my recommendation with specific instructions: thou shalt arrive at 6pm when it opens (don’t be intimated by the long queues outside), speak to the sparklingly efficient 50s-coiffed gal in the black-and-white-tiled entrance hall to put your name on the list for a table, sashay up the narrow stair case to another prettily 50s-clad young lady who will also take your name and seat you in the fabulous Gardels Bar for a drink and possibly a little morsel to whet the appetite. This is my preferred ritual, anyway. I love to soak up the luxurious dark-wooded, bovine-skinned atmosphere of Gardels with a tequila-based cocktail and some delicious ceviche croquettes or pulled pork sliders. Alternatively sit at the fabulous studded leather bar and watch your cocktail being made – here are masters at work. Feel transported to another era with rockabilly tunes and glimpses of the Elvis-quiffed, tattoo-armed chefs dashing through. When your table is ready (which can take a while on busier nights) you’ll be escorted downstairs into a cavernous room with a central atrium and cozier spaces to the sides. The service here is impeccable and I love calling the sommelier over to impart his wisdom on the largely Argentinean wine list. The uninitiated are given an explanation of the style of dining – wood-fired meat dishes feed 2-3 people so order according to the size of your party, and accompany with some sides. We have tried both the 8 hour lamb which falls off the bone, and the pork which comes with copious quantities of the best crackling I think I’ve ever had. Favourite sides include shaved fennel, apricot and olive salad, and the brussel sprouts which are crisp-fried with lentils and mint, a very far cry from my childhood memories of this vegetable. All the sides have a zingy acidity which perfectly balances the richness of the meats. If you’re not squeamish you must also try the morcilla, or blood sausage, which comes with tender roasted capsicum. 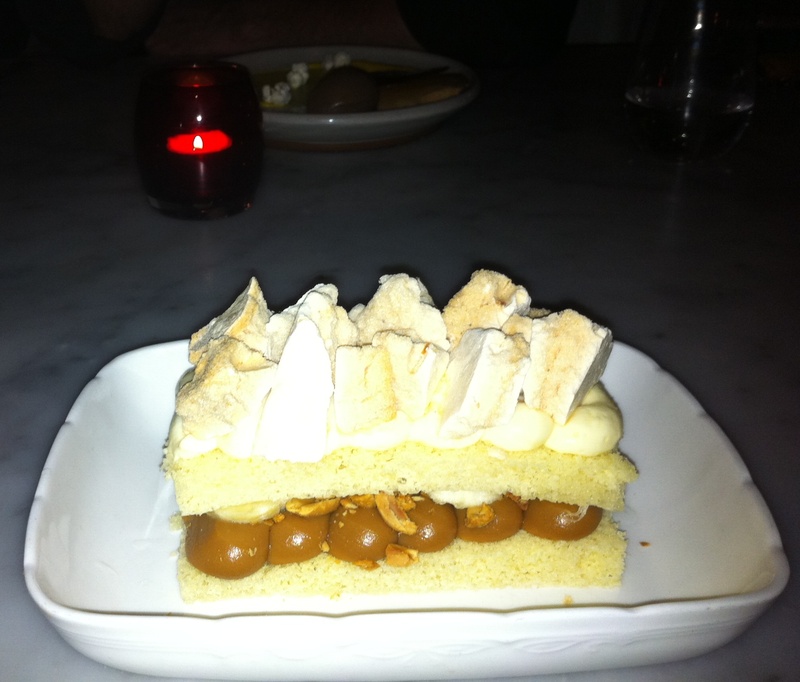 On our most recent visit I just about had room to squeeze in the South American style pavlova for dessert. Topped with jagged peaks of honeycomb meringue, this is an impressively large stack of sponge layers sandwiched with generous amounts of dulce de leche, custard and roasted peanuts. Dainty it ain’t but it sure is yummy. At around $70 per head all in, this is not a cheap night out but neither is it outrageously expensive. For me it works because it’s the full package – delicious food prepared with passion, service that runs like a well-oiled machine, and an atmosphere equally beguiling for a romantic dinner ‘a deux’ or a larger celebration with friends. Ariba Porteno!